The artist managed to solve the difficult task of combining the features of classicism, romanticism and realism. All this complements each other so organically that it is impossible to draw a clear line. In many paintings lurks anticipation of impressionism. The landscape of the master is first of all the mood. one feels all the trepidation, mobility, subtle vibration of the strings of nature. The artist did not attach much importance to working with color, he believed that it was more important to show objects in motion. Vibrating strokes and a slight hint of silhouette helped to achieve the effect of rustling leaves and the breath of the wind. In the color solutions the master tried not to repeat the same shade, the pictures breathe with the transparency and trembling of the atmosphere. The artist combined the decomposition of the main color into shades with their subsequent placement on the “Gust of Wind” canvas with contrast points. This gives the picture a special quivering. The yellow scarf of a woman against an almost monochrome background became such a bright point in the picture. His reflections on the firmament give the image a volume and a special sensation of space. Gloomy, closed fast-moving heavy clouds, branches, inclined by the wind, and disturbing reflections. Against this background, a lonely female figure, overcoming the wind. This clearly romantic symbol of the confrontation between man and nature is softened by the play of halftones and a sliding stroke that deprives the silhouette of clarity. Changeable lighting enhances anxiety. 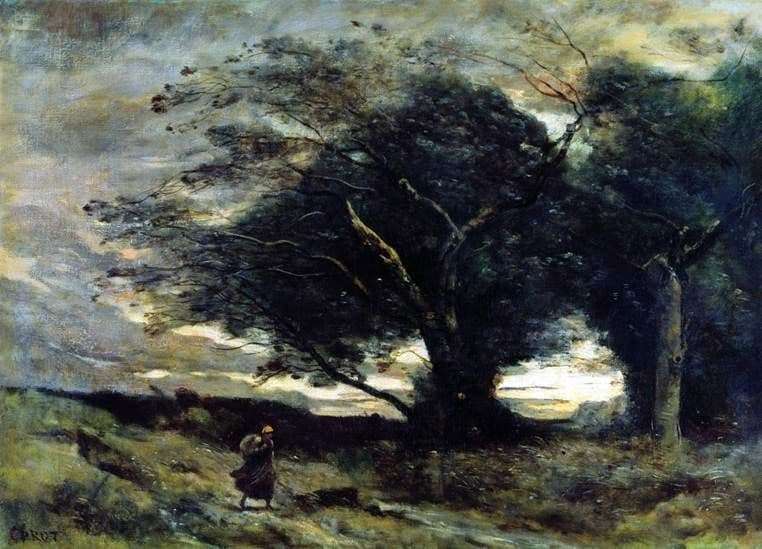 The movement of nature and the walking figure is not fully expressed, there is no storm of feelings and the riot of nature inherent in romanticism. This is just a small movement, a premonition of the coming storm, an understatement of the future impressionism.